that he may no longer seduce the nations. Amen. race and the ruin of souls. Amen. Given to us by our Dear Pope Leo XIII, 1884. It’s interesting that the commenter above thinks that this is an exorcism prayer, and yet it doesn’t seem to be any more bold then the commonly used short form prayer. Is it possible your link refers to another exorcism prayer by the same Pope? You prayer above is a preamble to the exorcism prayer of Leo XIII. Most of the exorcism portion has been removed, yet where it says “Behold the Cross of the Lord; be scattered, hostile powers”…who are you speaking too? 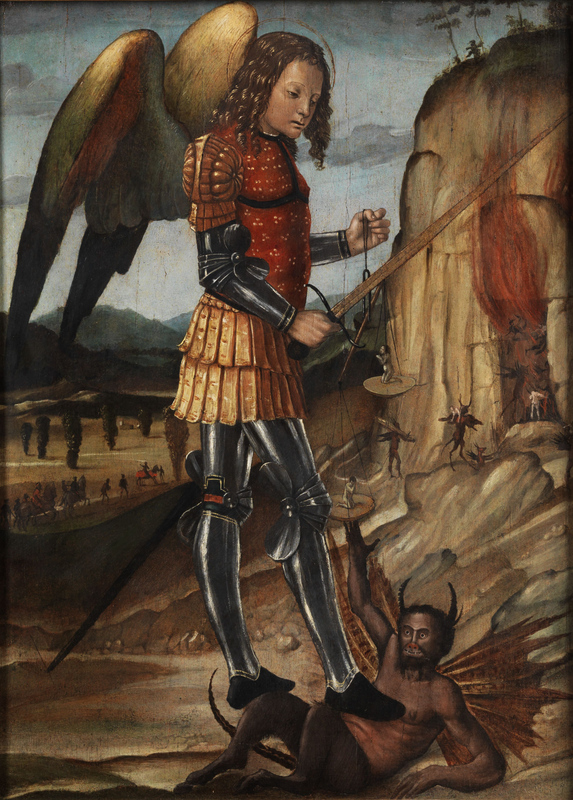 Not St. Michael…and not God. You are speaking to the Devil or a demon. I would say that it still contains elements of an exorcism formula and falls within the prohibition of the Holy See. To be sure, see if you can find an exorcist and ask him. That is the best way to find out. And you could also first find out from an exorcist before making any pronouncements! This prayer doesn’t contain any exorcism, preamble or not. What is scary about it? Is it scary to say “Vade Retro Satana” (Go back Satan)? I don’t think so; therefore, the excerpt you quoted is not scary. This prayer is also posted on Taylor Marshall’s site (a traditional theologian). Interesting how post Vatican II, this prayer that was proper to the laity, is suddenly not for the laity? Hmm. I wonder why? Should we not pray against the demonic forces in the world? Is that the real objective? I have reached out to my exorcist friend, to see what he says. Will let you know. And it is not a matter of being scary or not. It is a matter of Canon law and the Church being prudent. Ok..my friend who is an exorcist just got back to me, and according to him the version that you have above is not prohibited by the Holy See. Hello, The prohibited prayer is the one that is in the Roman Ritual, Chapter Three of the section on exorcisms. So…one slice of humble pie for me please!!! Thanks for confirming Dominican Tertiary. I would have hated to be leading anyone into danger! Laity is definitely not allowed to use this exorcism prayer. You should remove it from your blog immediately. 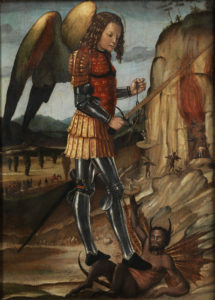 “The St. Michael Prayer that has been forbidden to the laity is NOT the Prayer to St. Michael, which Catholics may pray publicly and privately in all kinds of circumstances, including after the rosary, after Mass (but outside the liturgy to comply with Church norms) or any other time one wants. The Church greatly encourages this prayer. In fact, 1994 Pope John Paul II asked people to say it more often. A Polish bishop once told a priest I know that the reason was the increase of the demonic in our world. I appreciate the clarification, but to be safe, I will stick with the easy-to-remember and just as effective short version St Michael’s prayer. I also try to say on a regular basis the St Michael Chaplet, which we pray in the name of all nine choirs of angels. If said on a regular basis, we are promised to have 9 angels from each choir accompany us to Holy Communion, and we will have St Michael’s continual assistance along with all the holy angels throughout our earthly life. And I personally need all the help I can get!